The cloud workload scheduler automates, monitors, and controls the workflow throughout the cloud infrastructure. This automation usually manages hundreds of thousands of workloads per day from a single point of control. A workload is a process or set of processes that can be componentized, individually operated upon, and produce a product, with the abstraction being above the network, hardware, and operating system layers but requiring security at each layer. 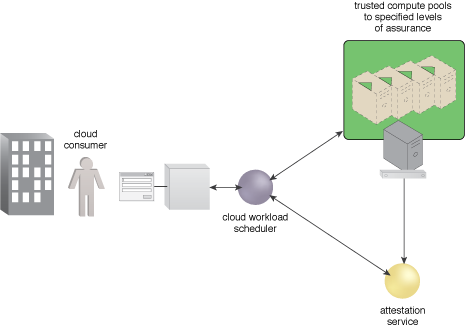 Figure 1 – An example of a workload that is scheduled for processing by a cloud workload scheduler. Figure 1 shows a cloud workload scheduler that is used by a cloud consumer to schedule a workload for processing. The cloud consumer could also be an orchestration engine automatically scheduling workloads. The scheduler must be provided the security level required by the workload. Referring to an attestation service, the workload scheduler selects the resource or resource pool with the required security assurance level. The attestation service stores the security level of service resources as they are booted and reported via a secure reporting process.